Mill Spring, N.C. – U.S. Para-Equestrian Dressage presented by Deloitte athlete Rebecca Hart made history at the FEI World Equestrian Games (WEG) Tryon 2018 on Wednesday. She and El Corona Texel earned the first ever WEG para-equestrian dressage medal for the U.S. 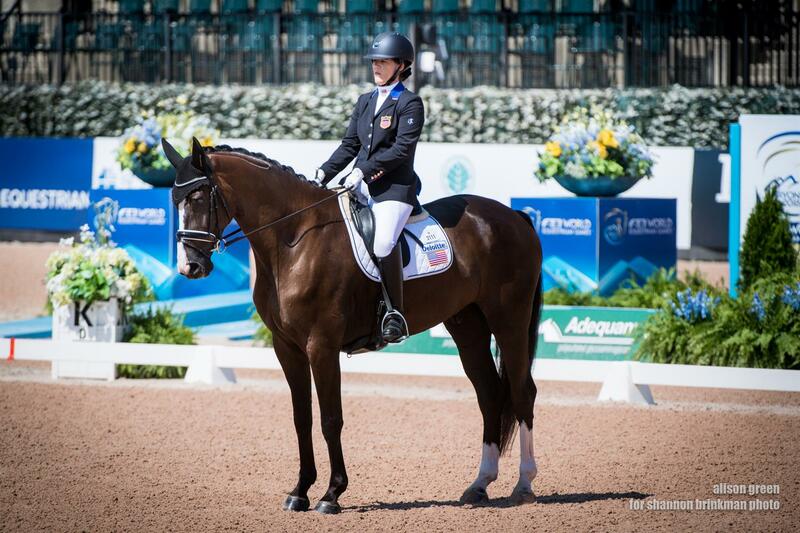 Competing in the FEI Grade III Individual Test, they earned the bronze medal with a score of 72.235%. What is more, their bronze-medal achievement derived from a personal best score in a FEI Grade III Individual Test, breaking the score of 71.618% they set over the winter during week two of the Adequan Global Dressage Festival CPEDI3*. 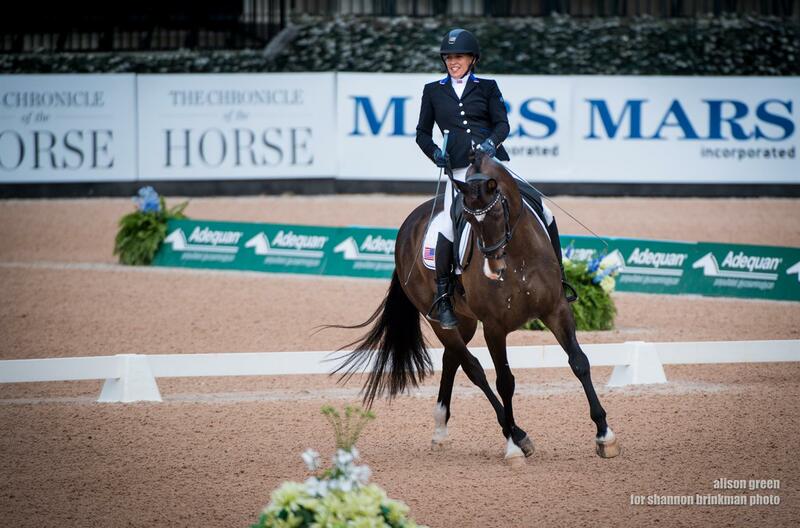 “I’m thrilled; it’s absolutely phenomenal,” said Hart, a three time WEG competitor. “To be able to do it on home turf with my family watching, and it’s our first U.S. WEG medal ever and my first medal ever, so this will not be coming off my neck. I’m just absolutely thrilled,” said an emotional Hart. Hart (Wellington, Fla.) and “Tex”, Rowan O’Reilly’s nine-year-old Dutch Warmblood gelding, have been working together for only a year, but no one could tell based on the superb test they exhibited. For a horse that has never competed in a world championship and has transitioned from able-bodied dressage to para dressage, he proved his reliability today. “He hasn’t experienced this kind of atmosphere before, and he is quite sensitive, so I wanted him to stay with me. To have him do that is fantastic. Six months ago, that wouldn’t have happened; he’s so incredibly talented and so kind. There was a little transition period, [moving] from able-bodied to para-dressage. He didn’t always get it, but he always offered me something. Even when he wasn’t sure, he was always there for me, and he was there for me in that ring today,” said an elated Hart. Kai Handt has been the U.S. para-equestrian dressage chef d’equipe for six years and has been coaching para-dressage athletes for 11 years. He has been close to para-dressage medal efforts but never experienced one until today. Hart’s medal is extra special. “We have been nipping at the medals for the past couple of years, and finally, now the program is coming into its own. We hired Michel Assouline as a coach’s coach for us and for coach development. We have been very busy re-educating these athletes and getting them to the level to compete internationally. The [USEF/USPEA] Center of Excellences have [helped us] come together and provide [facilities] where athletes can compete to see the level of competition. We are getting the coaches properly educated, and they understand what it takes to get this point and compete at this level. I’ve been trying to get [a medal] for 11 years . . . this is a dream come true,” said Handt. Dolton performed the FEI Grade I Individual Test during the afternoon session. She and the six-year-old Hanoverian gelding owned by Kate Shoemaker went second in the order and presented a strong test. They held a podium position for most of the competition but placed fifth with a score of 72.143%. “He is so young; I didn’t know what to expect. He proved everyone [today]. He really wanted to give the reins in the stretch down. He has a great mind, and we have prepared the horses well,” said Trunnell. Since both combinations placed in the top eight and scored above a 60 percent in their Individual Tests, they have qualified to compete in Saturday’s Freestyle in their respective grades. Para-equestrian dressage competition continues on Thursday with the FEI Grade V Team Test at 9:30 a.m. ET and the FEI Grade II Team Test at 10:45 a.m. The FEI Grade IV Team Test, featuring Kate Shoemaker and Angela Peavy from the U.S., will follow at 2:00 p.m. Their scores will count towards the overall team score. Watch it live via the USA Para-Dressage Facebook page.